Whether or not the success of 3D TV hinges on the popularity of 3D films like Avatar, or just our willingness to give in and wear stupid glasses, one thing is clear: TV makers are all about 3D right now. Sony for instance, has 3D laptops, TVs, and Blu-ray players (plus 3D PlayStation games) planned for next year, and now a senior Sony Exec says 30 to 50 percent of all the TVs it sells from April 2012 will be 3D-enabled. The extra 3D hardware inside the TVs isn't likely to have a big price premium, but the glasses required to see 3D content could be sold separately for up to $200. 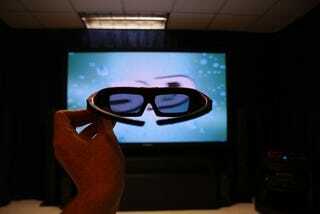 The idea is to keep TV prices down, and let users grab the glasses if or when they want.